Connect wired headphones, second Bluetooth headset, car audio to Bluetooth radio. Bluetooth protocol: 4.1 EDR. 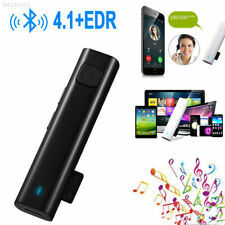 Bluetooth audio receiver is suitable for all AUX output devices. 1X Bluetooth adapter. Audio interface: 3.5mm. Portable Handheld Translator. - Casio Chinese English Electronic Dictionary. - Battery Powered (2 AAA). The box on this unit is banged up, please see pictures, unit has been used twice. I am selling this Waverly Labs Pilot Real-Time Language Ear Translator Translating Earpiece which is Used! Comes as seen in the photos. used, Box is banged up, Great for the Traveler! Color White BID NOW and Thank you in advance for looking! Shipping We ship using USPS We strive for Positive Feedback, and we would like to offer a great customer service experience. If you have a questions or issues please feel free to contact us. Thank you for looking and HAPPY BIDDING! 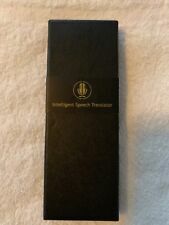 3 out of 5 stars - Waverly Labs Pilot Real-Time Language Ear Translator Translating Earpiece Used! 1 product rating1 product ratings - Waverly Labs Pilot Real-Time Language Ear Translator Translating Earpiece Used! Speech Translation: Just press the “A” button and start talking, then release the button it will automatically translate your speech into “B” language. On the contrary, press “B” button, it will translate your speech into “A” language. The box on this unit is banged up, please see pictures, Charging case is scratched up but works, one of the rubber earpiece covers is missing, Used. Please see pictures. I am selling this Waverly Labs Pilot Real-Time Language Ear Translator Translating Earpiece which is Used! Comes as seen in the photos. Box is banged up, Great for the Traveler! Color RED Ready to ship fast to you, BID NOW and Thank you in advance for looking! Shipping We ship using USPS Sorry, No Returns. Thank you for looking and HAPPY BIDDING! Learning a language has never been this easy or portable before now! Simply put, you can learn an ENTIRE LANGUAGE with the help of the Partner ER900 or you can have it talk for you. The new U-Learn feature even lets you learn hands and eyes free! Excellent pre-owned condition. Works great. Please see pictures for details. Originally included a plastic filler piece where cartridges can be inserted. That piece is missing. Batteries ARE included. CCTACO Partner PW800 English/Italian. Talking Electronic Dictionary in the Box. Also note that I'm not a "Expert" and may not have complete knowledge of the particular item. WHAT YOU SEE IS WHAT YOU GET. Vasco Electronics LLC. Our products combine these features with reliability, efficiency and advanced technology. Vasco Traveler Premium 7". Vasco Traveler Premium 7” allows you to communicate in foreign languages even if you don’t know them. So batteries need to be replaced. Just for a fraction of the value these units are well worth it. Atlas Modern Dictionary© English-Arabic (Encyclopedic). Arabic-English dictionary. Compact Oxford English-English dictionary. This is a fully functional item and in very good condition. Magically, all these essential phrases and sentences are in 20 languages. Ectaco Partner Talking Electronic Dictionary & Phrasebook (Serial #PW80-8015230). Genuine Ectaco AC adapter SA115B-05 6V 2A 12W. Ectaco Partner Soft Carrying Case. 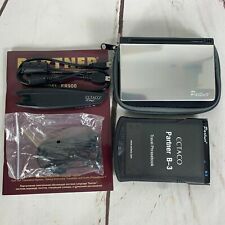 Partner Ectaco E Book Reader Translator P900 ER900 English German Dictionary B-3 Travel Phrasebook C-Pen. We follow up on every order. This translator needs Internet support. Smart Instant Translator Device -- it is with two-way translation,it will recognize what you said and speak out loud the translation result, it's 98% accurate.Use it when traveling to non-English speaking places. KORIDY iBook U3 4G. Screen width is 3.5" and overall width is 5". Very clean and has minor screen wear. Sharp crisp colors. 100% odor free, smoke free as well. Handheld English/Chinese Translator. Complete including user guide, soft faux leather case, power cord and ear buds (see pics). There are just a few light surface scratches on the translator. Pre-Owned - Very Good Condition. UP TO ACTION PARTNER 3 LUX ENGLISH/RUSSIAN TRANSLATOR/DICTIONARY. I never used this translator. Perfect for travelers, you speak into it and it translates it back into English or Russian.You can also used the platform and get other language translators to plug in and turn this into a translator of any of their long list of language plug-in. SMART INSTANTLY TRANSLATOR: The translator just need connect WIFI or hot spot, no need for SIM card, no need to download APP. Clear sound quality, no noise, and easy to carry, a perfect assistant of language translation. 1 x Translator. Translate your speech into high quality foreign language text and transmit into voice output. When translator is connected light will turn green. Translator can only be use when it is lit in green. For iOS user, after connected to iOs application user has to stay on the translator dialog interface while using translator or else it will not be in service. 1 x Translator. Support offline translation. 45 languages translated. Included: 1 x User Manual. Gross weight: 74g. Net weight: 152g. If item is defective after 3 months, you can still send it back to us. It is also voice translator and laser pointer. Product model: T15. support 28 kinds of different language translating. 13 3 1cm, you can put it in your pocket. bag, luggage case, briefcase. Bright laser pointer. Clear sound quality, no noise, and easy to carry, a perfect assistant of language translation. (3) Power on the translator; Then open the bluetooth and connect the device "Translator" with your phone;Open APP, it will scan and find the the "iTranslate" device. Realized a blink of translation into 42 languages ​​( ^ - ^ ). AI voice language translation x 1. √Support 42 languages ​​interactive translation. I translate very high translation accuracy and long sentences (400 letters). 【Speaking】 Record your pronunciation, score Analyze recorded voices and score and teach correct English pronunciation. [National language] Extensive knowledge. Efficient learning English conversation "English Training Gym" with English conversation learning at a glance installed. Korean-English, Japanese, Chinese electronic dictionary. Compatible with Tatung TAC-15/16/20 Series Rice Cooker only. We will mark the parcel as " Gift ". We provide USA Power adapter ( 2 Plate-pins AC 125V ) only. AC 125V 121W. We maintain high standards of excellence.